A chieftain of the party in Rivers state, Chief Eze Chukwuemeka Eze, who took a swipe at the party's apex decision-making organ in a statement circulated in Port Harcourt on Tuesday, also described as most unfortunate the constant attack on the Minister of Transportation, Rt. Hon. Chibuike Rotimi Amaechi, by Senator Abe, recalling that the senator is one of the highest beneficiaries of the Minister's magnanimity and investment into quality leadership. Eze, one of the loudest voices of defense of the APC in the South-South region, wondered why the leadership of the party had chosen to leave Abe without a sanction as he had continued to work with both external and internal enemies of the party to decimate and weaken the Rivers chapter of the APC, even as he did not hide his intent to render the party weak against his ally in the opposition People's Democratic Party (PDP), Governor Nyesom Wike, with whom he reportedly worked to deny the party her right to field candidates and campaign in the recently held general elections. He emphasised that Abe's crime against the party, to most watchers of development in the Rivers chapter of the APC, was more grievous than what the duo of the Imo and Ogun State Governors; Owelle Rochas Okorocha and Senator Ibikunle Amosun, were accused of committing, which earned them the axe, adding that it would only be just and fair if Senator Abe, after all he had done to harm and humiliate the party, was also sanctioned immediately, to send a strong message to those who might be reasoning along his line. "The party, in the same vein, through the National Publicity Secretary, Mallam Lanre Issa-Onilu, in a statement after the meeting, stated that the Minister for Niger Delta Affairs, Pastor Usani Uguru Usani, and the Director General of the Voice of Nigeria (VON), Osita Okechukwu, had been suspended for anti-party activities. "The suspension of the two Governors mentioned above stemmed from their plots to sponsor candidates from other political parties. While Okorocha sponsored his son in-law, Ogumba Uche Nwosu, as the governorship candidate for Action Alliance (AA), Governor Amosun on the other hand worked for the candidate of the Allied Peoples Movement (APM), Adekunle Akinlade, and has vowed to continue to campaign for him. "The Imo state chapter of the APC had already suspended Governor Okorocha and recommended his expulsion to the national body of the party. The two governors, who were absent at the recent caucus meeting of the party, won seats in the just concluded National Assembly elections to represent the APC in the 9th Senate. "Akeredolu on the other hand was accused by various interest groups within the APC in Ondo State of working for the Presidential candidate of the Peoples Democratic Party (PDP) during the Presidential election, leading to Atiku winning the state controlled by APC. 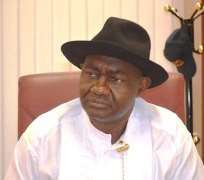 "Senator Magnus Abe has not only demonstrated his hatred for Amaechi, but exhibited plot to destroy and annihilate the party structure in Rivers state. I don't need to go in details as all his acts and feats in his single motive of destroying the party are in the public domain for any who has not been following his antecedents in this regard", he said. He said "this is a man who has stood against all the efforts of the NWC to restore unity and progress in the state chapter of the party until he was allowed to accomplish his mission of ensuring that the party doesn't field any candidate in the ongoing general elections in the country. "The acts of the NWC indicates that we have two separate laws guiding the party and such an act where Abe continues to align with Governor Wike and other PDP strategists to undermine and weaken the party in Rivers state is no longer acceptable and necessary actions should be taken before this man finally annihilates the party in the State. For records and clarification purposes, "Against the constitution of the party, Abe and his cohorts formed a parallel secretariat and State Working Committee. Even when the NWC directed that Rivers state should elect its elective representatives through indirect congress, he defied such a directive and embarked upon direct congress to elect himself as a gubernatorial candidate against the official candidate of the party. "Against the party's constitution that members should explore the party's constitution before going to court, he defied the party and sued the party and in connivance with PDP, the courts refused APC to field candidates for the elections, becoming the only state chapter in Nigeria that was denied an opportunity to participate in these elections, apart from the right to vote. "Abe, by his actions, has deprived the best of the leaders ever produced by Rivers state from contributing to the new Rivers state that the APC had envisaged. For the party and for the NWC to turn the blind eye on the atrocities committed against the party by Abe is to state to us that all our sacrifices and inputs towards building APC is in vain", Eze said.